Kent Sport has introduced a number of fantastic new classes to the timetable. These include Boxercise®, Spinning®, Cardio Tennis and Balance Bodies and they will be in the brand new studios at the Sport Centre on the University of Kent's Canterbury campus. Spinning / Express Spin: Burn calories, build CV fitness and tone on a stationary bike. Be inspired and motivated by the instructor but control your own resistance. 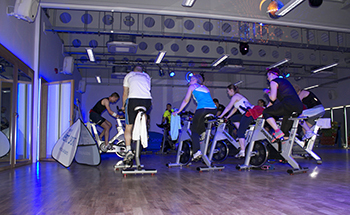 Mind, Body & Spin: Engage your mind & body with this low intensity spinning format. Be inspired by the music and focus on seated sprint intervals. Cardio tennis: Burn calories and improve your game with this new class combining simple tennis drills and circuit exercise. Balanced Bodies: A mixture of traditional mat based Pilates combined with a programme of stretches to improve flexibility and correct posture. Improve your core strength, range of movement and be injury free. Boxercise: Experience Boxercise using age old training principles to form a fun, addictive, safe, stress busting workout suitable for all ages and levels of ability. Jeni Dexter, Kent Sport Studio Co-ordinator says, "We are excited to be adding these new fitness classes to the existing timetable and to be able to offer such a wide choice. As they are all included in the price of membership we encourage everyone to give them a go." Kent Sport members can book fitness classes up to seven days in advance by visiting the Sports Centre or Pavilion reception. PAYG participants can book up to three days in advance. Kent Sport membership is available to off-campus community members as well as staff and students. To celebrate the launch of the new facilities, Kent Sport is currently providing a special offer. For terms and conditions and further membership details visit www.kent.ac.uk/sports/membership; and to keep up to date with the latest offers, information and photos, Like Kent Sport on Facebook at www.facebook.com/unikentsports.